Today we had an autumn storm in Portland. As I was heading home after teaching I first encountered heavy rain and lightening. Then very heavy rain, thunder, and lightening. Then the hail began. Water was standing and running down the interstate. As I was making my way steadily through it to get home, I had some extra time to reflect upon how grateful I am for the van I drive. Purchased with the sales money after selling my old house, the van was picked for a camping option. Mere months after it became ours I spent two weeks camping in it while at residential yoga teacher training. When we had a foot of snow this past winter, the van is what got me out to teach and kept us stocked up. It lets me move a large amount of yoga props, enough for 10 people for a fully Restorative Yoga session, all at once. This summer we camped overnight in it with the dogs before seeing the eclipse. 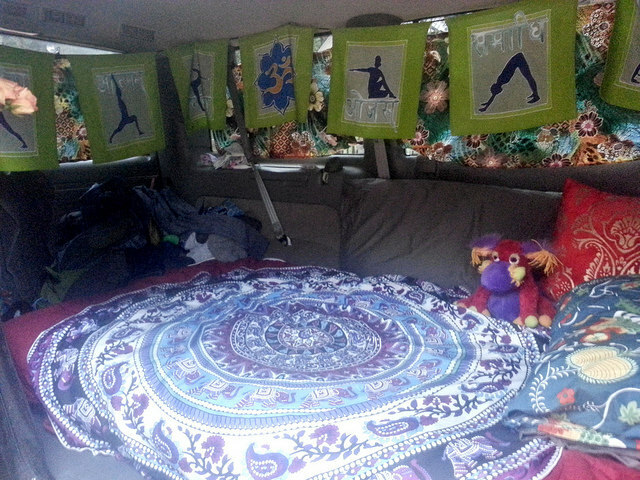 Last week I was camping in it again while assisting at the same residential yoga teacher training. I look forward to further adventures in the van and I'm so grateful for the safe, steady ride it provides us.